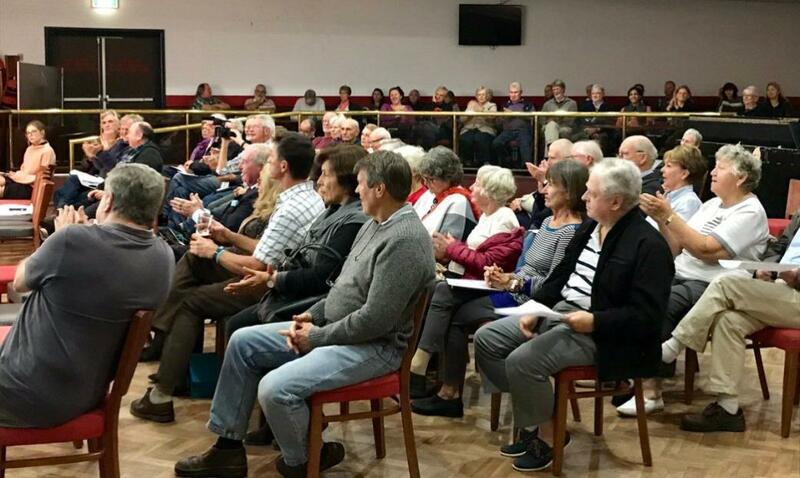 A community meeting in a packed auditorium at Mona Vale has endorsed the formation of a new coalition to campaign for the return of Pittwater Council. Residents at the meeting endorsed the strategy for a two-pronged approach involving possible legal action and a petition. Former Pittwater Councillor Bob Grace said he and a group of community members had formed a new association, Protect Pittwater, with the idea of litigating to restore the council. Its members include another former Pittwater councillor Sue Young, businessman David Wenden, Northern Beaches Greens Convenor Pip Rey and a former Pittwater Mayor Lynne Czinner. Mr Grace estimated that to seek legal advice and prepare a statement of claim would cost between $5,000 and $10,000 - so the group was setting up crowd-funding page to finance it. “I urge you, if you want Pittwater back, we have to fight now,” Mr Grace told the meeting, asking residents to contribute generously. When speaking to Mr. Grace on Friday he stated, "When you look at the recent decisions regarding Ku-Ring-Gai and Woollhara council, we believe we have a good case and can win. We would certainly not require so much (funding) of what they have had to do to get to this stage - we would only have to fit within the decisions made there, and we do." Greens MLC and local government spokesperson David Shoebridge recommended a second strategy for the new association’s campaign, with a petition to the state government. “There is a process where, if you get 250 residents or 10 per cent of the former Pittwater area to sign on to a lawful petition, you can actually (go to) the minister and demand a public inquiry about de-amalgamation,” Mr Shoebridge said. However, Mr Shoebridge agreed Pittwater residents had a good basis to commence legal proceedings, following the success of the Kur-ring-gai action and Woolhahra winning the right to appeal in the High Court. “There’s a lesson there about the reality of power in NSW,” he told the forum hosted by Northern beaches Greens. “They won’t listen to you unless you have something to actually make them listen to you. Founding convenor of the independent Better Planning Network, Corinne Fisher, told residents that by banding together to campaign for the restoration of Pittwater they would have a lot of power. “I’ve learned that you generally don’t convince politicians with rational argument,” she said. “You mostly convince politicians because power is on your side. Craig Boaden, President of Pittwater Forever - a coalition of 18 residents’ groups – said his members had agreed to support the new association. And Friends of Mona Vale spokesman Mark Edwards kicked off fundraising for Protect Pittwater with a $200 donation from the group, along with Mr Shoebridge who donated $100. 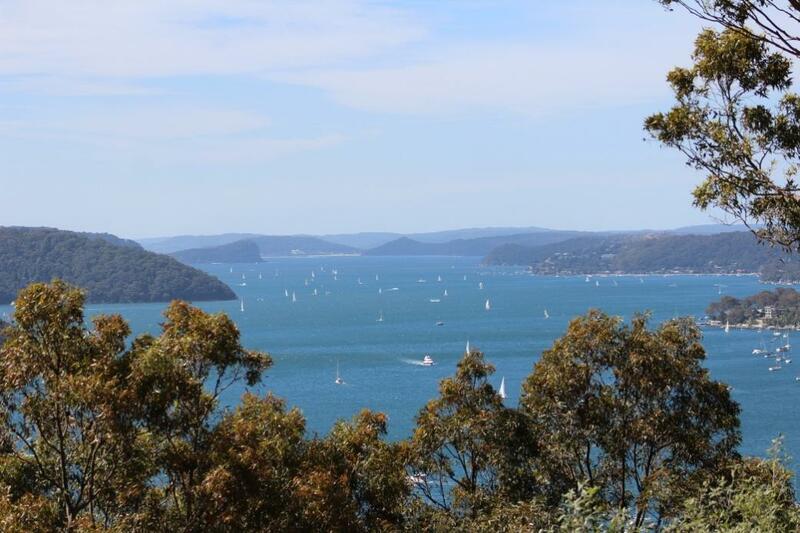 Pittwater - To Be Or Not To Be? ONE NORTHERN BEACHES COUNCIL OUT OF THE QUESTION: At its 13 October, 2014 meeting, Pittwater’s councillors reviewed the NSW Government’s local government reform package ‘Fit for the Future’ (FFTF), which was released in September 2014. The proposal, reconfirming the Independent Local Government Review Panel’s recommendations that Pittwater be merged with Manly and Warringah to form one council, was rejected. Resident Birds Baffled By B-Line Sleight Of Hand: Where Did All Our Trees Go? Protect Pittwater Community Forum: 7 P.M. Tuesday May 16 At Pittwater RSL - What impact will the new government body - the Greater Sydney Planning Commission – have on Pittwater? How will development approvals be carried out? 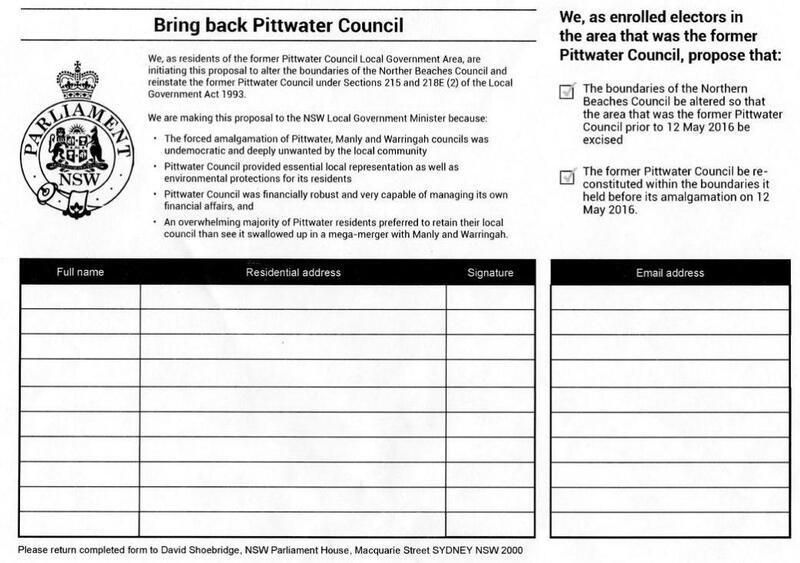 How can we recover our local Pittwater Council?